Our Bespoke Conversion. 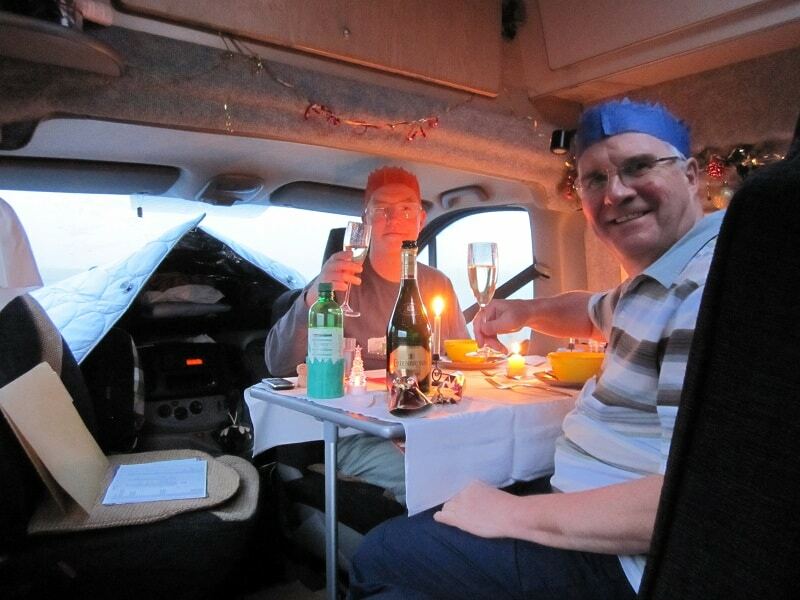 When we finally decided to get a motorcaravan we had very specific requirements. We wanted a small footprint vehicle for mainly winter use for ski trips to the Alps which was well equipt and we’d be happy to stay in for several weeks wild camping at a time. Our chosen base vehicle was a long wheelbase, high roof Renault Trafic. This is just over 5m long and less than 2m wide so it would fit in our drive. We needed to fit in 5 belted travel seats, a double bed, shower/toilet, kitchen with rings, grill, oven, sink and fridge. A fresh water tank, two propane bottles and as much storage space as possible. To cope with winter use abroad we also needed diesel fuelled heating and hot water. A compressor fridge, two large leisure batteries and a solar panel to help keep them charged. All this was a tall order, so we needed to find a flexible constructer to build it for us. When we found Mill Garage we knew we had the right people to carry out our bespoke conversion. We found a 2nd hand Trafic panel van on the internet. Mill Garage were able to check it out for us, send someone to see it in person, buy it if suitable and take it back to their workshop in Duns. We were on a ski trip to the Austrian Tirol while all this went on. And actually paid for the base van over the phone while in a gondola lift going up to the Kitzbuheler Horn. We had already discussed what we wanted with Mill Garage. They helped us come up with a layout that would squeeze in everything we wanted. We then went about deciding exactly what heating and hot water system we wanted. Which hob, sink and fridge, where the windows, water tank, batteries, and gas bottles would go and the exact sizes of the dinette/bed and cupboards. This involved e mailing Mill garage with detailed plans and measurements. They would have been happy to plan it for us, but we knew exactly what we wanted and wanted to plan it ourselves. Which was fine with them. Meanwhile, Mill Garage removed the bulkhead and bench passenger seat. Sourced and fitted a single passenger seat and fitted both cab seats on swivel plates. They then mocked up our layout in spare plywood so we could check the general layout was practical and everything would fit in. We then visited the workshop again and saw the mock up. This let us be sure there was enough room in the van. That the bed and wash room were big enough and the kitchen would have enough space to work in. Mill Garage then set about building our bespoke conversion for real. We visited their workshop several times to check on progress. To confirm details like the exact size and shape on the dinette table and what upholstery we wanted. Mill Garage were even able to make us very attractive two tone seat covers for the cab seats and dinette bench seat which gives our interior a very professional look. The finished van is superb and even better than we had hoped for. Once we had collected it and been away for our first few trips we went back to Mill Garage where they were happy to add a few extra shelves and fold up work surfaces for us. Best of all, when we drove off, no rattles and squeaks due to the build quality! We’ve been away skiing in the van a lot, sometimes on trips of up to 4 weeks. Temperatures have dropped to minus 18 C at night. But we have never been cold in the van thanks to good insulation and the Webasto air and water heating. It has been well below freezing day and night sometimes. Even for several days and apart from a couple of easily solved teething problems we have never had frozen pipe issues either. We rarely stay in camp sites and only infrequently use a hook up. We usually drive a little bit each day and that helps keep our batteries topped up. With our winter tyres and snow chains we have explored ski resorts all over Austria, Switzerland, France and Germany. Oh, and Scotland of course! Sometimes the roads have looked more like ski runs than roads. We have occasionally woken up to find the van blanketed in a foot of new snow. That’s when you need your snow shovel! As well as enjoying the snow we have also turned out all sorts from our kitchen. Everything from fresh baked scones and cakes to roast haunch of venison and homemade pizza. We’ve even done a full blown 4 course Christmas dinner. Complete with roast turkey and all the trimmings followed by flaming Christmas pudding. We did have a “flat” turkey though. Our oven wouldn’t stretch to a whole bird but a roasted turkey breast was just as good and it was easier to carve! All in all we’re very pleased with our bespoke conversion. We’re already planning our next one with improvements like a fixed bed, eye level oven and mid level fridge. No more bending down to look inside! And we’ll be able to tumble straight into bed after too much wine with dinner!